It's beautifully designed, but somehow seems a little lighter and less opulent in person. It would be ideal in a small space but gets dwarfed in a larger one. 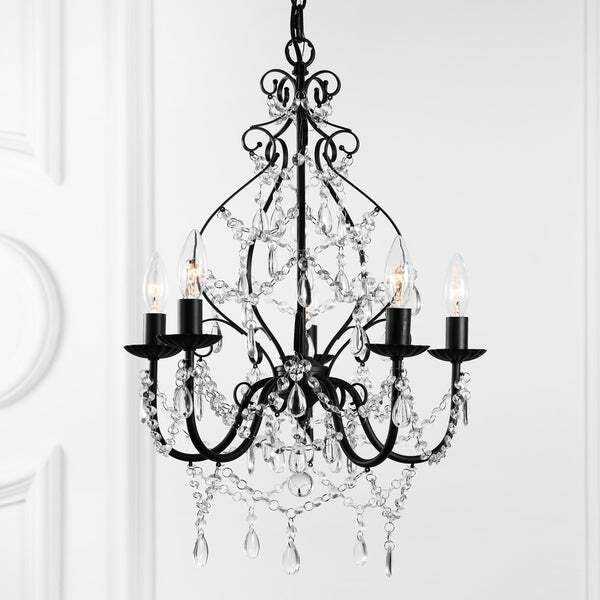 You'll love this chandelier's cascade of clear crystal hanging accents and classic ironwork finished in a matte black. The draping of beads adds a magical touch to this elegant light fixture, which boasts a classic silhouette reminiscent of the antique chandeliers collected in Paris antiques markets. The chain is adjustable prior to installation, allowing the drop to range from 26.5" to 98.5" from ceiling to the base of the fixture. As this fixture must be hardwired, we recommend a professional electrician manage installation. Dimensions 17.0 In. X 17.0 In. X 98.15 In.